For many conspiracy theorists, Oliver Stone is perhaps a shining light, whether he wants to be or not. But this documentary series arriving for the first time on DVD, is perhaps one of his least controversial works. 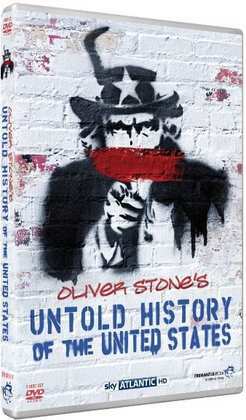 Out on 1st July courtesy of FremantleMedia International, Oliver Stone's Untold History of the United States contains three discs and carries a recommended retail price of £29.99. Co-written with American University historian Peter J. Kuznick, a companion book running at a mere 750 pages is also available. "[this] focuses on events that at the time went under-reported, but crucially shaped America's unique and complex history of the last 110 years. The series debunks the heroes by restating the facts, whilst crediting those heroes lost to history." "Exploring questions such as What did Stalin say to President Truman to make him drop the atomic bomb on Japan? ; Did Eisenhower betray the US? ; What were the real reasons behind World War 1 and II? and Was Reagan one of the worst or best Presidents of all time?, the American story is told in a way that has never been told before." "It is the deepest contribution I could ever make in film to my children and the next generation. I can only hope a change in our thinking will result."